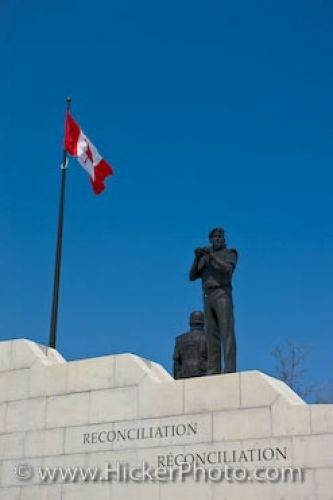 Standing along a stone wall are soldiers and the Canadian flag at the so called Peacekeeping Monument in city of Ottawa. One of the soldiers stands with binoculars in his hands. The other soldier has his back to the wall. Reconciliation is carved into the stone wall. The stone wall represents the resolution for peace that the soldiers have worked for and continue protecting.